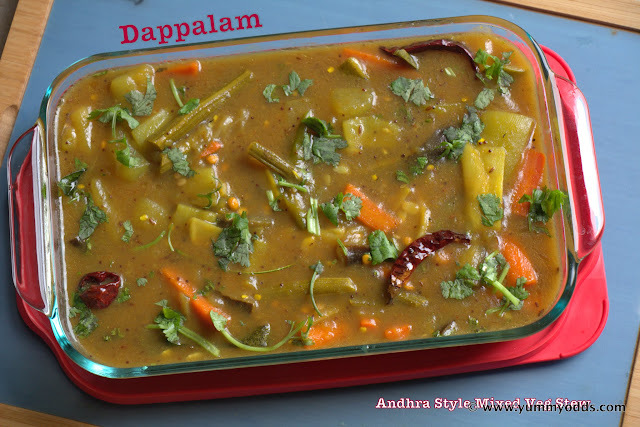 Dappalam is a very fine and traditional delicacy of Andhra Kitchen. If Sambar is to State of Tamilnadu, then Dappalam is to State of Andhra Pradesh. 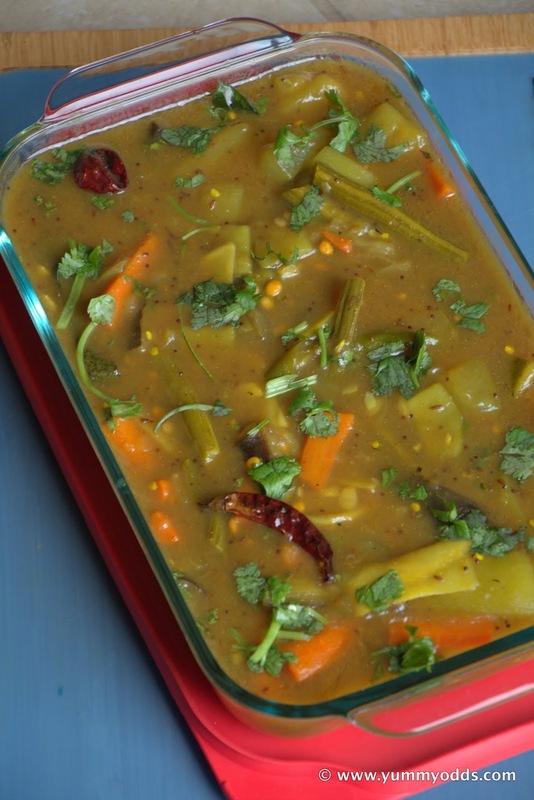 Both dishes are common in, vegetables getting cooked in tamarind stew but Sambar is cooked along with lentils ( pappu), where Dappalam is served along with lentils (Pappu). That is the difference. 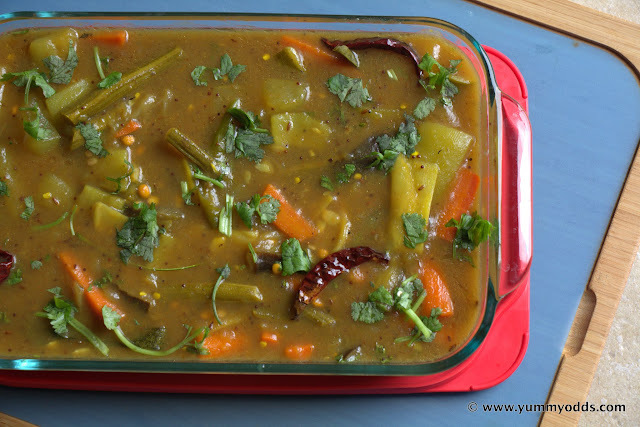 This is also called as 'Mukkala Pulusu', (ముక్కల పులుసు) literally translates to Mixed Vegetable Stew. This goes well with rice and it is very nutritious as lot of squash vegetables are cooked in this stew with very less oil. This is one traditional recipe that is made for festivals like Sankranti or Ugadi makes this Festive Dish. By making this dish also you can bring the festive touch on a normal regular day. :-) Here is the recipe, Njoy! Take a heavy bottom pan and add mixed vegetables, onion, green chili except pumpkin along with 1 cup of water and boil vegetables for 10 min. Add tomato and pumpkin pieces ( gummadi kaya) and cook for 5 more minutes. You notice that vegetables are semi cooked and becoming tender. Now add tamarind extract to the pot, add remaining cup of water. Add salt, red chili powder, coriander powder, rice flour to the pot, mix everything well and cook for 10-15 minutes until you get thick stew consistency. Taste and adjust all the seasonings, add jaggery and cook stew until jaggery melts into it ( 5 more min). Keep non-stick pan on another stove, add oil. Once oil is hot, add red chili, chana dal, urad dal, cumin seeds, mustard seeds, curry leaves, turmeric powder and hing( asafetida) and make the tempering. Add this tempering to stew and mix well. Finally add coriander leaves ( cilantro) to the stew pot and switch off the stove and transfer to serving bowl. Serve with hot white rice, along with mudda pappu ( plain dal) and some ghee! Yummmm Sounds delicious and heavenly. If you don't have time or patience you can pressure cook in step #, but that won't give you the authentic taste for this dish. my fav.. sounds very simple but nothing can beat the taste of it.. Very true Veena, simple but great taste!